Dreaming into the infinity of imagination, and finding your passion. 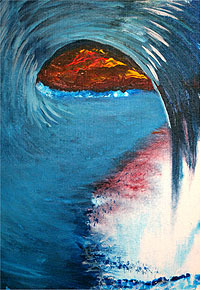 Within this secret wave I share, a magnificent liquid flux of one water drop to the next, and it's quest to infinity. 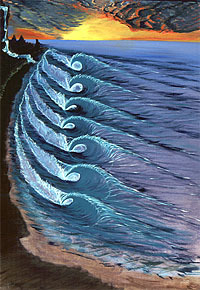 I was so drawn to these miniature waves that I spent a good part of 5 years trying to capture them on film. They are mesmerizing and make really strange sounds like as if you were yelling in a tunnel. Some are a mere centimeters high moving at super high speed and reflecting light in a distinctive and mysterious way. Water seems to have viscosity to it and the smaller you go on the scale the more thicker and soupy it breaks. These micro-waves have really opened my eyes to the real magic of surfing and the possibilities of what may exist out there beyond earth, and to be in absolute awe with every moment we have. Wave riding truly is a lifetime passion that will forever change you. Scott Carter is known around the globe for his achievements as a filmmaker. Yet as an artist and photographer, his eye conveys to the rest of us, a world only Carter was once able to see. Born and raised in Southern California, Carter's passion was discovered in the first wave he rode -- opening his mind to infinite possibilities. In 1986, he purchased his first camera and water housing unit, not knowing that this would impact his life forever. Carter became a cinematographer. Carter traveled around the Pacific in pursuit of the perfect wave. In 1990, he moved to San Francisco armed with years of footage, and refined his skills as an editor. Carter produced the classic bodyboarding movie, ENOUGH SAID in 1992. It tipped the bodyboarding world on it's ear. Carter also produced THE INSIDE in 1996. Both have become two of the greatest cult-videos in the genre. Carter also worked as director of photography for the first MTV Sports Show, and as photographer/creative director for STOMP. As the digital age advanced, Carter found the synergy between camera lens and computer screen. Honing his editing skills as a filmmaker, Carter enhanced his palette through conceptualization and imagination. Focusing on high-speed 16mm cinematography as well as digital imagery, he wanted to make a serious impact on the wave riding industry. The opportunity arose when Carter was tapped to direct FIRE, a documentary about 11x World Champion bodyboarder Mike Stewart. Carter became the creative force behind the project and delivered a film unlike any other. Seven years in the making, FIRE won the 2005 Cinema Paradise Art Film Festival Award in Honolulu. The success of FIRE is a milestone to Carter's projects finding a mainstream audience. Carter's unique perspective shines in LIQUID FLUX, a beautiful book that illustrates years of collecting images, thoughts, and graphic depictions of the ocean's many moods. A vision of another time and place through hypnotic miniature waves. 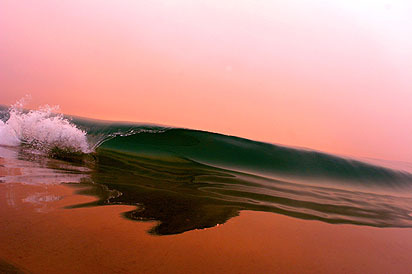 The miniature waves captured through the lens of his camera offer a unique perspective which showcase Carter's genius. His work in photography was the focus at the orange county fair in 2007 and he became the featured artist right next to Rick Rietveld. Last year Scott also signed into a big contract with one of the finest art galleries in southern California, McKibben Studios in Corona Del Mar. The owner of this fine gallery Steve Mckibben, quated Scott's imagery as, "bitchen" and now publishes Scott's select works into limited editions on Giclee at the McKibben Studios Gallery putting Scott's work next to some of the greats like Ron Croci and Rick Rietveld. Scott Carter's photography has been published on the covers of DÉCOR, SURFERS JOURNAL, SURFING MAGAZINE, and RIPTIDE, "Art is in the eye of the beholder", Carter says, "sometimes you can make a masterpiece without knowing it, and many times you can create something out of nothing, and that's the magic. ".